The Michigan Department of Transportation (MDOT) just launched a new online map tool that gives users the ability to track local bridge conditions. 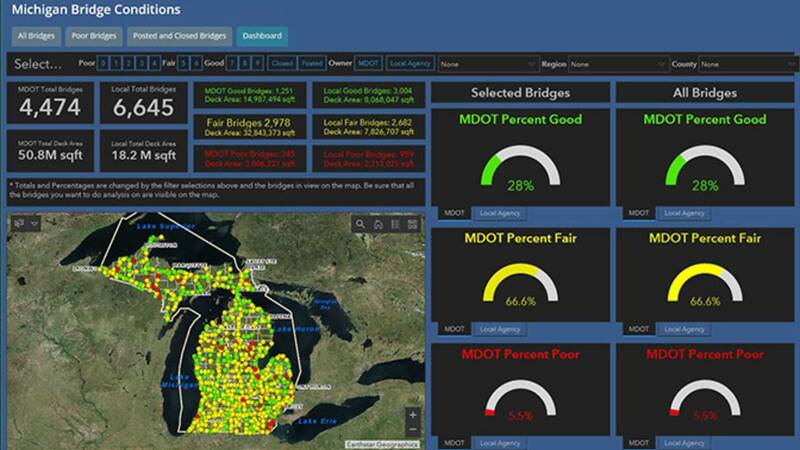 "We're very excited about the new dashboard," said Matt Chynoweth, head of the MDOT Bureau of Bridges and Structures. "This supports both the governor's and state transportation director's objectives of transparency in government. It's a great tool, allowing the public to easily look into the condition of any bridge, MDOT or locally owned." Bridges on the state (I, M and US routes) and local road systems are rated good, fair or poor. The dashboard shows visual representations of the number of bridges in each category, while an interactive map on the site shows the location and color-coded status for each structure. Users can sort and view data by bridge rating, ownership or geographical area. Zooming in on the map and clicking on an icon for an individual bridge pulls up more detailed information about that structure. Federal law defines a bridge as a structure carrying traffic with a span greater than 20 feet. The law also requires that all bridges be inspected at least every two years to monitor and report condition ratings. These ratings are based on a 0-9 scale and are assigned to each culvert and each deck, superstructure and substructure of each bridge. Bridges rated from 7 to 9 are designated "good," while ratings of 5 and 6 are "fair," and ratings from 0 to 4 are in the "poor" category.